This decadent cauliflower gratin made with the King of cheeses is the perfect addition to any Christmas dinner. It is simply divine! 1. Preheat oven to 200°C/Fan 180°C/Gas mark 6. 2. Add the cauliflower, chestnuts and cream to a large pan and bring to the boil, reduce to a simmer and cook for 10-12 minutes or until tender. Remove the cauliflower and chestnuts with a slotted spoon and set aside. 3. Now add the Parmigiana Reggiano and thyme to the cream and return to the boil then reduce to a simmer for 10 minutes or until the cream thickens. 4. Meanwhile make the herb breadcrumbs, place the bread into a food processor and blitz until you have fine breadcrumbs, now add the remaining ingredients and blitz until fully combined. 5. Return the cauliflower to the cream mixture and season to taste. 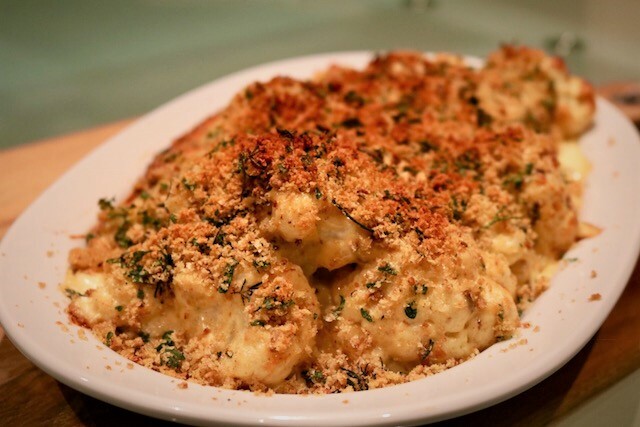 Spoon the cauliflower and Parmigiano Reggiano cream into an ovenproof dish and sprinkle over the herb breadcrumbs. 6. Place in the oven for 5-10 minutes until golden and the sides are bubbling. Enjoy! * Parmigiano Reggiano cheese, known as the King of Cheeses, is one of the world’s oldest and richest cheeses – still produced today as it was nine centuries ago. * A long ageing period is fundamental in building the aromas and texture of Parmigiano Reggiano. Such complexity is achieved in a totally natural way, without any additives, making Parmigiano Reggiano 100% natural, easy to digest and high in calcium. * The minimum maturation time is at least 12 months, but only when it reaches approximately 24 months of age, is at its best. Ageing can continue up to 36 months or more, during which time the cheese develops its flavour, texture and digestibility. * Parmigiano Reggiano is a P.D.O. product. P.D.O. products are defined and protected by European Union law in order to defend the reputation of regional foods. This mark ensures that Parmigiano Reggiano can only be produced in Parma, Reggio Emilia, Modena, Bologna to the west of the Reno River and Mantua to the east of the Po River.